Spanish Chicken and Rice can be made with either a whole chicken or chicken breasts. It makes a whole lot, so be ready to feed a crowd with this dish! Enjoy! Place chicken in a slow cooker with 1 cup water and cook on high until the chicken reaches 165°F, about 3 hours. For a quicker way to cook the chicken, place chicken in a large pot of water and bring to a boil, reduce heat and simmer for about 45 minutes or until cooked through. Save cooking liquid to use as chicken broth later. Cool chicken slightly before shredding. Add chicken broth and rice to a large pot. Bring to a boil, reduce heat and simmer until rice is tender, about 45-50 minutes. 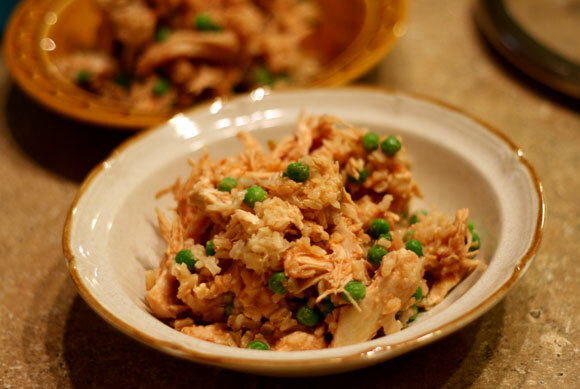 Add shredded chicken, green olives, peas and salsa. Gently fold to combine.